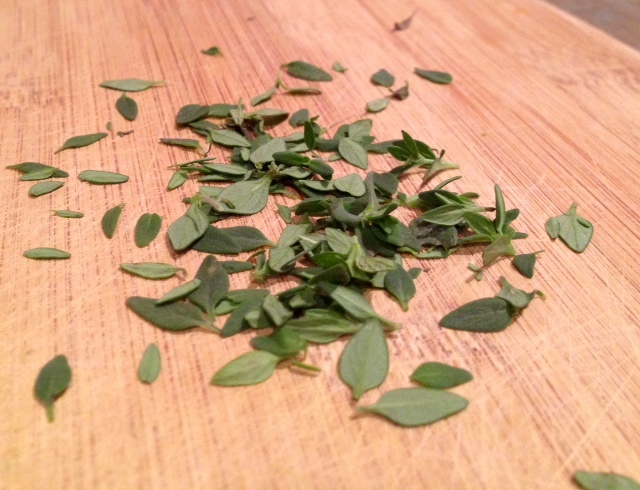 I feel like I have to sneak one more winter-y recipe in here, even though it’s TOTALLY SPRING! Oh man, I’m so glad it’s spring. Bring on farmers market fruit and veggies, grilling out, and foods that make me feel skinny. But first—hearty, cheesy, decadent (but not TOO decadent) girls’ night food. We had a girls’ night at my place a couple months ago, and wanted something super easy, that I didn’t have to put a ton of time and effort into while we were all drinking wine and chatting. 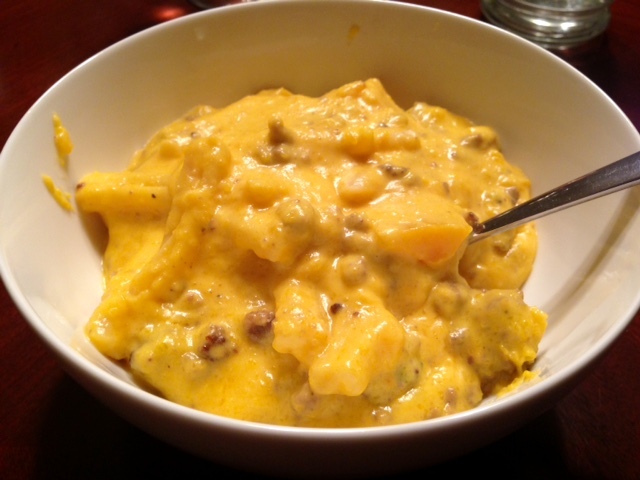 This recipe came together very fast, and the only complicated piece was cutting up the butternut squash, but you could easily just buy it pre-cubed. 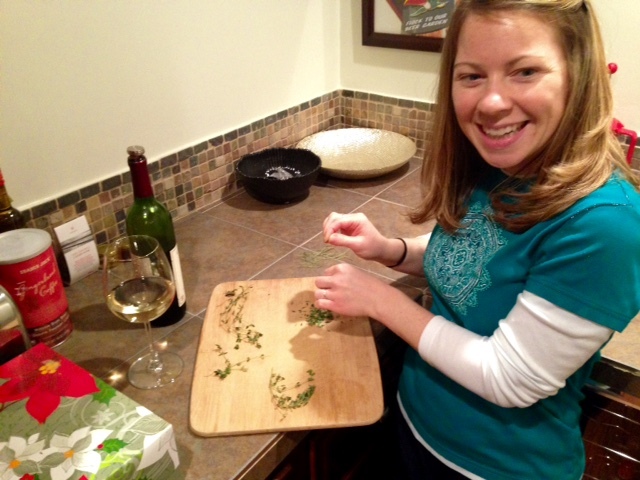 I even had a pretty helper—that girl’s got her priorities, has both a glass and bottle nearby! 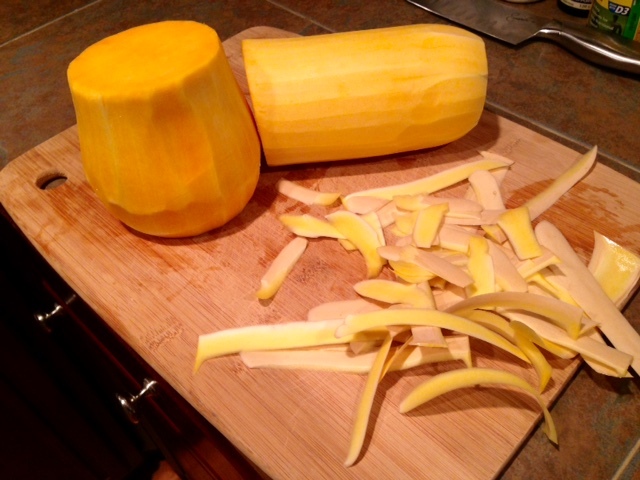 First, disassemble the butternut squash (if necessary). Fill a medium pot halfway with water and add a pinch of salt. 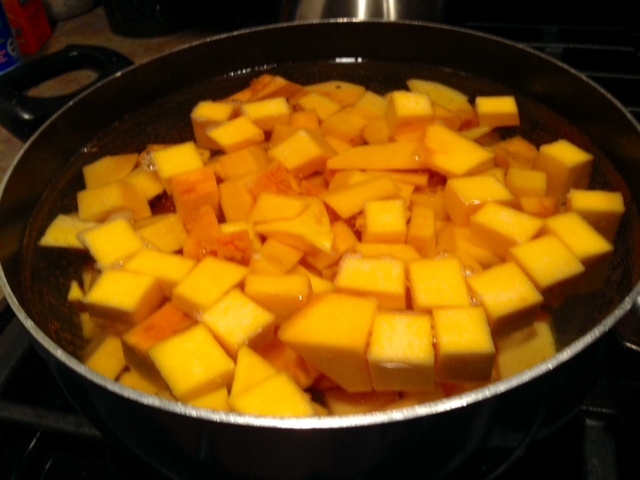 Set over high heat, then add the butternut squash and bring to a boil. Cook until tender, 5-6 minutes. Drain the water and set the cooked squash aside. Boil the water for the pasta, then add salt and the pasta. Cook until al dente. Drain and set the pasta aside. While the pasta is cooking, make the sauce. Put the pot from the butternut squash (or a large skillet) back on the stove, reduce heat to medium, and add the cream, thyme, mustard, 1/4 teaspoon kosher salt, and 1/4 teaspoon pepper. Cook, stirring frequently with a whisk, until it’s slightly thickened, about 3-4 minutes. Add back the butternut squash. Remove from heat and either (carefully!) use an immersion blender to completely puree the sauce, or pour into a blender to puree. 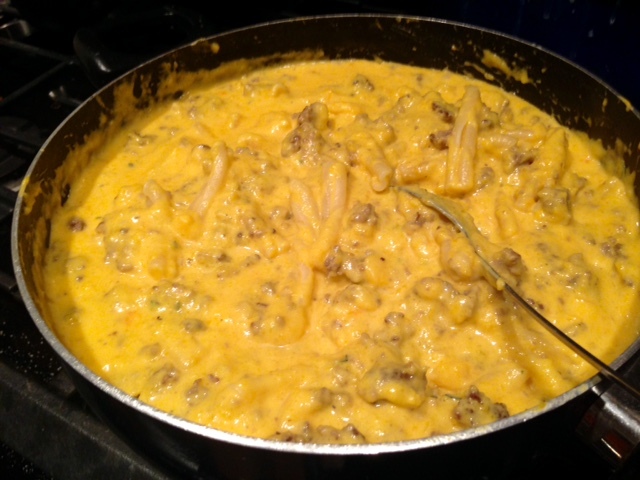 With the pureed sauce back in the pot, add the cheese and stir until melted. Taste, adding additional salt and pepper if desired. Finally, add your pasta and hamburger to the sauce, stirring gently to coat everything. Serve right away, it starts to get pretty thick pretty fast! Fill a medium pot halfway with water and add a pinch of salt. Set on the stove over high heat. Add the butternut squash and bring to a boil. Cook until tender, 5-6 minutes. Drain the water and set the cooked squash aside. Boil the water, then add salt and the pasta. Cook until al dente. Drain and set the pasta aside. While the pasta is cooking, make the sauce. 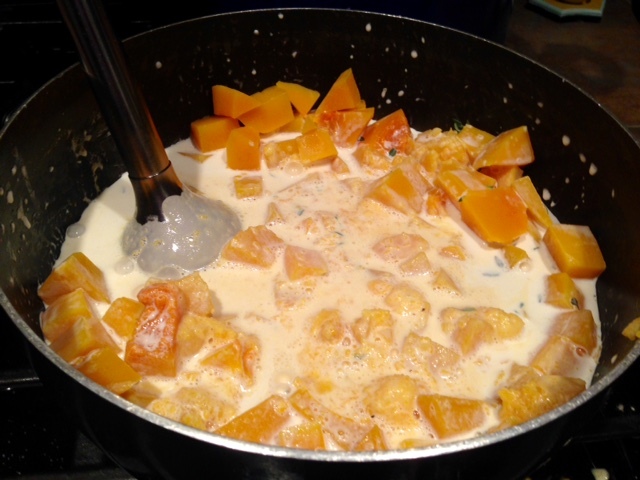 Put the pot from the butternut squash (or a large skillet) back on the stove, reduce heat to medium, and add the heavy whipping cream, thyme, Dijon mustard, 1/4 teaspoon kosher salt, and 1/4 teaspoon pepper. 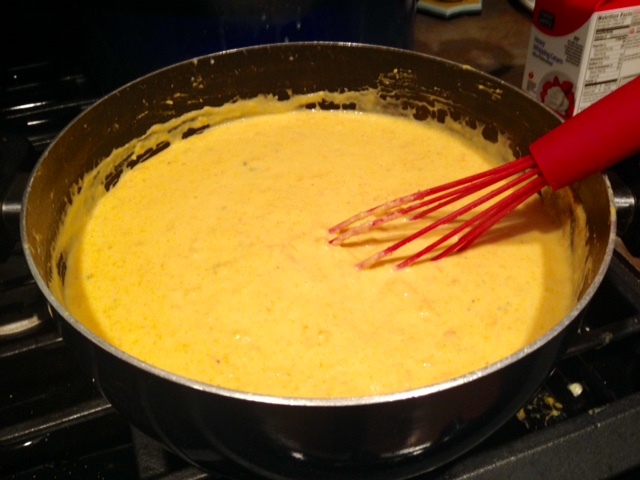 Cook, stirring frequently with a whisk, until thickened slightly, 3-4 minutes. Add back the butternut squash. Remove from heat and either (carefully!) use an immersion blender to completely puree the sauce, or pour into a blender to puree. Return to the pot. Add the cheese, stirring until melted. Taste the sauce and add additional salt and pepper if desired. Add the pasta to the sauce (and cooked beef, if you’re using) and stir gently until all of the pasta is coated. I just made this tonight, and it was Awesome!!! My kids & husband wanted seconds……which never happens! I didn’t have whipping cream, so I just used whole milk with a roux. Also used gluten-free brown rice pasta, and it turned out great! Thanks for the recipe!!! ?